When you think of beloved animated classics, the idea of cartoon characters getting older seems like a foreign one. Because of this, Cars 3 seems more akin to a later installment of the Rocky saga, with the title character past his prime, than your usual feel good animated romp. The Cars franchise has been a mixed bag since its humble beginnings in 2006, and each sequel (and Planes spin-off) have struggled to raise the quality in the series. Cars 2 was a hyperactive mess, following up a film about a rookie race car with a spy thriller involving a dimwitted southern pickup truck. Sure it had its moments, but overall, it failed to live up to the original. Cars 3 attempts to right the ship, and it does in many ways, but it ends up deciding to be a different movie in its last few minutes, forsaking its target audience and opting to follow a current popular Hollywood trend. As a fan of Owen Wilson since his small role in Armageddon nearly 20 years ago, it’s easy for me to favor his charming red race car persona, Lightning McQueen. In 2006’s Cars, McQueen overcame his own over confidence and ego to become a winner on the race track. McQueen took a backseat in Cars 2, probably much to the disappointment of any youngsters who’d grown to love McQueen on home video. And, sadly, over a decade since the first film, which really isn’t that long of a timespan to warrant a plot like this, Cars 3 brings McQueen back into the spotlight, but treats him like a washed-up has-been instead of a legend. It’s unfortunate, too, because any fans hoping Cars 3 would have car #95 come out on top again will be left sorely disappointed. The message the film tries to send is admirable, but it’s done in a somewhat deceptive way. The character of Lightning McQueen is used much in the same way that a magician might use misdirection to keep an audience focused on something appealing while he’s using slight of hand to pull off something entirely different. McQueen’s Rocky Balboa-style comeback training is all a ruse for something else. And it’s starting to feel like too much (of a current Hollywood trend–especially within Disney’s empire of franchises) when you discover what the bait and switch turns out to be. Cars 3 ends up being one of those movies that feels like it spent an hour and a half setting up something and then, in the last minute, decides to do something else; it ends up feeling like a poorly conceived story–or just a rotten thing to do to diehard fans. After hearing the filmmakers affectionately talk in the special features about what they were trying to do with the story, I understand what they were going for, but it still feels like a disappointing direction to take this story in. After the surprisingly violent action film that was Cars 2 (in a kids sense, of course), Cars 3 is a pretty mild film. The only two moments that might upset younger viewers may be McQueen’s nasty wreck early on in the film (which they immediately follow-up with him a few months having been repaired), and a “Crazy 8” demolition derby that McQueen and Cruz get into that has monster cars threatening them and other cars crashing all around them. It’s mostly played for laughs, but it still may be intense for some littler viewers. Heck, my then-6-year-old saw the trailer and decided the movie looked too harrowing for his taste — and he still hasn’t seen it (and doesn’t want to). Otherwise, there’s no profanity in the film, but there’s a joke about not using bad language during the derby, and then we soon hear a car shout “Get the *horn honk sound* out of my way!” And as a joke, McQueen says to Cruz, “Life’s a beach, then you drive,” which is a play off of a little more explicit saying. That, however, is pretty much the extent of the objectionable content. While this review sounds like I did anything but like Cars 3, I did feel like it was overall a step above the 2011 sequel and more of a return to form for the franchise. I may be sensitive about the whole “getting too old for what you love” idea, but at the same time, I feel like it does a bit of disservice to the character of Lightning McQueen, in a way that doesn’t seem fair or warranted. Cars 3 does a few things right, but in the end, mostly feels like a missed opportunity for a third outing and ultimately feels like a needless sequel. If you want to remember your favorite Cars characters as they were by the end of Cars or Cars 2, definitely let it end there; don’t see this one. If you don’t take your Cars too seriously, and wouldn’t mind just seeing them take another lap around the track–no matter the result, then you just might like what Cars 3 has to offer. 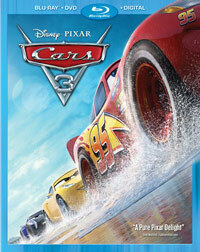 Cars 3 is available in a Blu-Ray/DVD/Digtial combo pack, on DVD, in a 4K Ultra HD release with a Blu-Ray disc and digital copy, and in a 3D/2D Blu-Ray combo pack — as well as separately through the usual digital movie providers. The regular Blu-Ray disc has a fair amount of extras–as does the iTunes digital copy:Short: Lou (6:45) – I didn’t see this movie in the theaters, but this most have been the Pixar short that played before it. In the cartoon, a box of lost and found objects teaches a playground bully a lesson. It’s pretty cute and heartwarming, but it’s also a bit heartbreaking to see the bully terrorize the kids. It has a great twist (and message) at the end, though. Short: Miss Fritter’s Racing Skoool (2:47) – The packaging for Cars 3 makes a big deal about a new “animated short” being included here, but it’s literally just a mock commercial for Miss Fritter’s racing school, with testimonials from various cars. Deleted Scenes – There are six deleted scenes, including an introduction from the director. All of the scenes are different takes from what was in the finished film and are presented as animated storyboards. Sometimes they feature the actors’ voices, and sometimes they feature the scratch takes. Ultimately, they’re scenes from a different version of Cars 3. In the first scene, Cruz is different, acting more confident as she races McQueen. She even dances a little “good luck charm” dance on the beach. Next, Cruz and McQueen talk outside his trailer in a different version where she, again, is more confident. The third scene reveals that Cruz, at one point in her life, had a mentor. In the next one, Cruz practices and fantasizes about racing in a race when McQueen stumbles upon this. Finally, Sterling actually sees Cruz’s potential (instead of denying it), which the filmmakers realized was the wrong way to go with the story. My First Car: A Green Car on the Red Carpet with Kerry Washington (1:51) – Actress Kerry Washington talks about her first car, a green Prius, that she got when she moved to California. Ready for the Race (5:42) – We get a look inside of Hendrick Mororsports’ training facility for race car drivers. Pixar went there to study about racing. A Disney Channel star plays host here, interviewing 19-year-old William Byron who talks about training to be a race car driver. The host–who’s never even driven a car before because she’s too young–gets a try on the practice simulator, too. Let’s. Get. Crazy. (7:42) – Actress Lea DeLaria, who plays Miss Fritter, hosts this segment about Fritter and the Crazy 8 demolition derby scene. Generations: The Story of Cars 3 (11:18) – The director and film team talk about the process of finding the plot for the third film, trying out variations of which character wins the race at the end, and what the story means for Lightning McQueen’s character, as well as Cruz Ramirez’s. It talks a lot about how our roles change as we get older, morphing from one thing into another, and how that plays out for McQueen’s character. Cars to Die(cast) For (5:21) is dedicated to the toys that have been made for all three Cars films, and how over 1,000 diecast toy cars have been made so far! We meet some of the diehard collectors here as well. Worlds Fastest Billboard (5:30) is about the hidden posters and products throughout the Cars world. They talk about the graphics made in the film and highlight some of their favorites. My First Car: Old Blue (1:20) – Craig Foster, a Pixar Graphic Artist, shares about his Ford pickup in this animated short. My First Car: Still in the Family (2:16) – Valeria Barra, a Pixar Technical Resident, shares about how she grew up in Tuscany, Italy, and how special it was to get her first automobile. Finally, there are a slew of other extras, including Feature-Length Commentary; Fly-Throughs that are camera-pans of digital sets like Thomasville (1:08), Florida International Speedway (0:36), and Rust-eze Racing Center (0:55); 4 Promos; Cars D’oeuvres, which is a collection of promotional animations; Car Reveal promos for McQueen, Ramirez, and Storm, and 5 Cars 3 Movie Trailers. Alcohol/Drugs: We see the inside of a bar and grill place where cars are drinking oil. Violence: McQueen crashes badly in slow motion with pieces of wreckage flying everywhere. Ambulances rush to his aid and the scene fades out; We see video footage of the Hudson Hornet crashing badly, too; McQueen uses a video simulator track to practice racing and it goes haywire, sending him thru the video screen; We see flaming tires and explosions at the demolition “Crazy 8” derby. It’s a very violent scene where even the leader, a bus named Miss Fritter, has a buzzsaw stop sign. It’s mostly played for laughs, as Cruz and McQueen try to survive the craziness, but it will be intense for young viewers; Miss Fritter charges at them and ends up flying into a billboard.